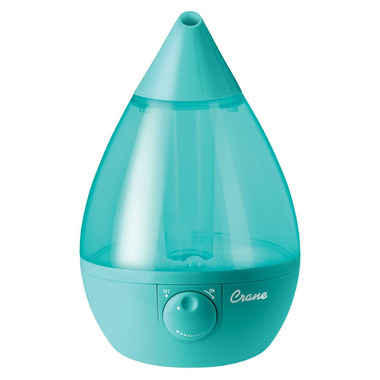 This ultrasonic Crane Teardrop humidifier can help relieve nasal congestion, dry cough, and sinus irritation, so you can breathe easier for a good night's sleep. This ultrasonic humidifier features a sleek teal teardrop design, and with a 1 gallon (3.78 L) water capacity can produce up to 2.1 gallons (8 L) of moisture a day. I'm happy with this purchase. It's easy to clean and it lasts all night. It's very quiet and I love the teal color. Super quiet and my humidistat reports I no longer live in dry winter air. It's easy to fill and the colour makes me happy. Works great but has a high pitch hum (considered whisper quite) that keeps me up so I can't run it while I'm sleeping. It's a great product, does exactly what description said, very quiet and the mist is perfect and cool! I'm very satisfied and it looks great. I recommend this product for sure!